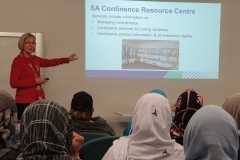 The third and final continence session was held last week. 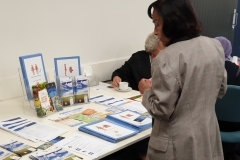 The third session was a day tour to the Continence Resource and Independent Living Centre in Gilles Plains. Everyone gathered in the morning at the MWASA office on Victoria Square in the city and travelled out together. 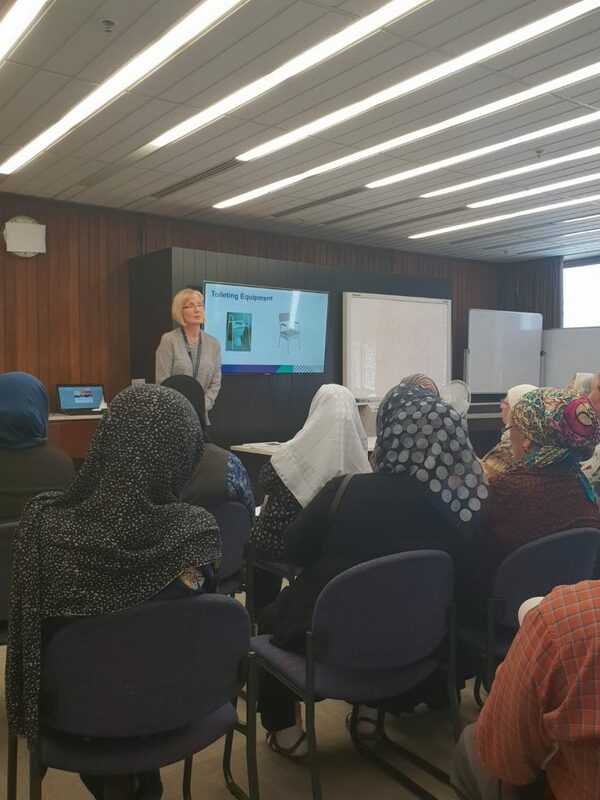 The tour commenced with a welcome talk by Rosalie the Registered Nurse, who works at the Continence Foundation. 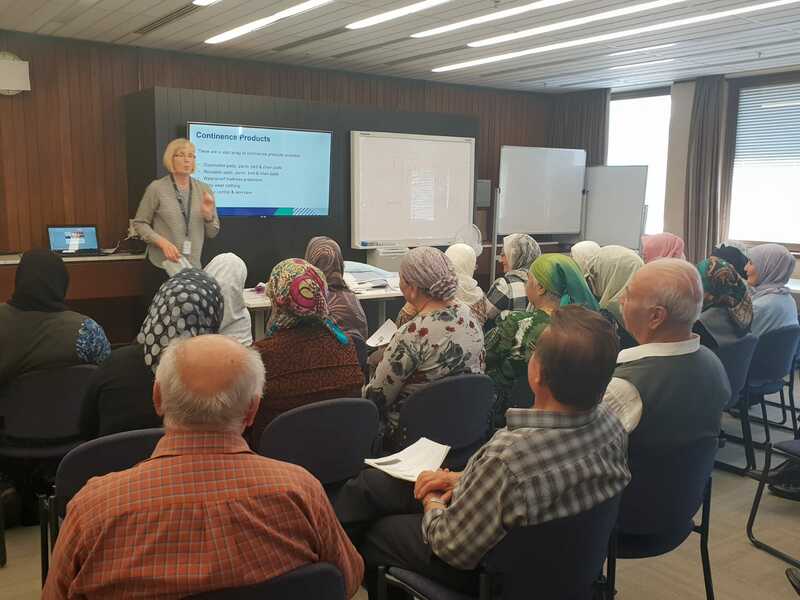 Three interpreters were provided to ensure that everyone could understand and benefit. 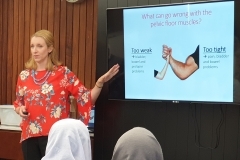 Following on from the welcome, Sonia the Physiotherapist gave a talk about the parts and function of the pelvic floor muscle. Sonia instructed our group on how to properly perform the Kegel exercise. Everyone was very attentive and felt comfortable to ask questions. One member asked how frequently the exercises should be done and Sonia suggested that at least 3 times a week should be enough. 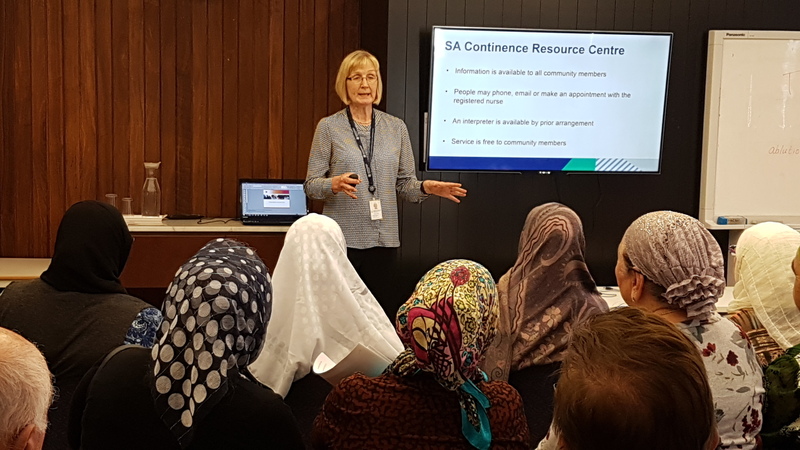 The next speaker, Lisa, provided further information about where to go for help if someone is experiencing the problem of incontinence. 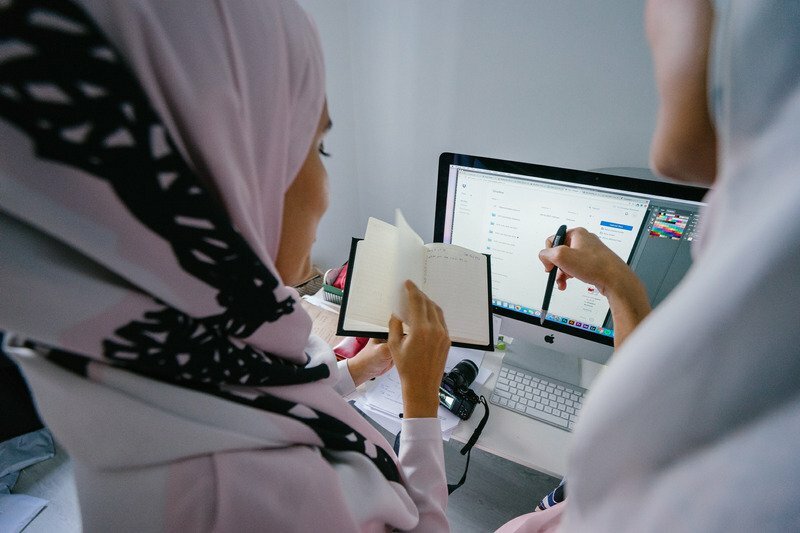 There are many types of health care workers, the first visit can be to the family GP (General Practitioner) and then the GP can refer on to the Physiotherapist or other specialist, or a nurse can also provide assistance. 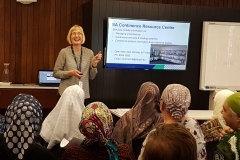 Lisa informed everyone about the Continence Foundation website, which shows information in 32 different languages, and she let everyone know about the helpline so that they are aware in the case the need assistance. 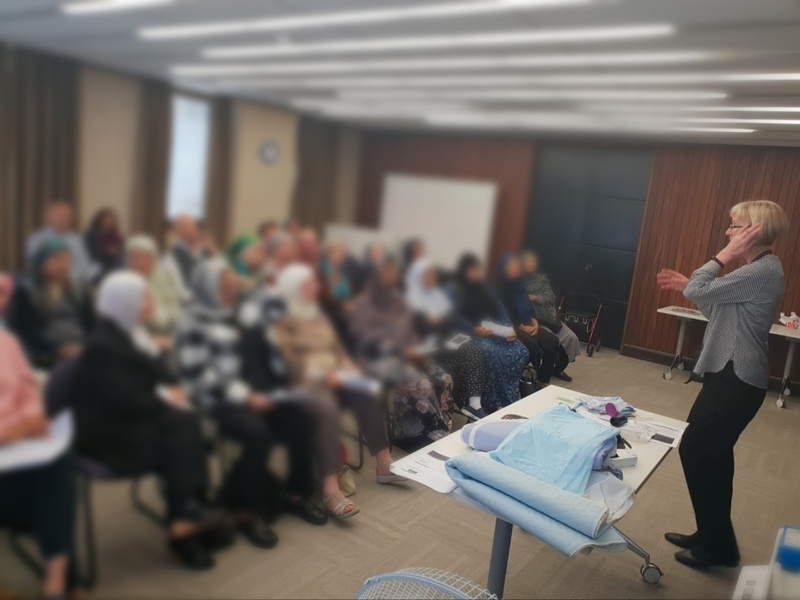 Finally, the Occupational Therapist gave the group a tour which included demonstrations of the different kinds of equipment that a person can use to live independently. The equipment ranged from different types of beds, to kitchen utensils, gardening tools, personal care kits, walking aids, wheelchair cushions, scooters of different kinds, toilet seats and much more. Overall the day was incredibly informative and all participants learned so much. 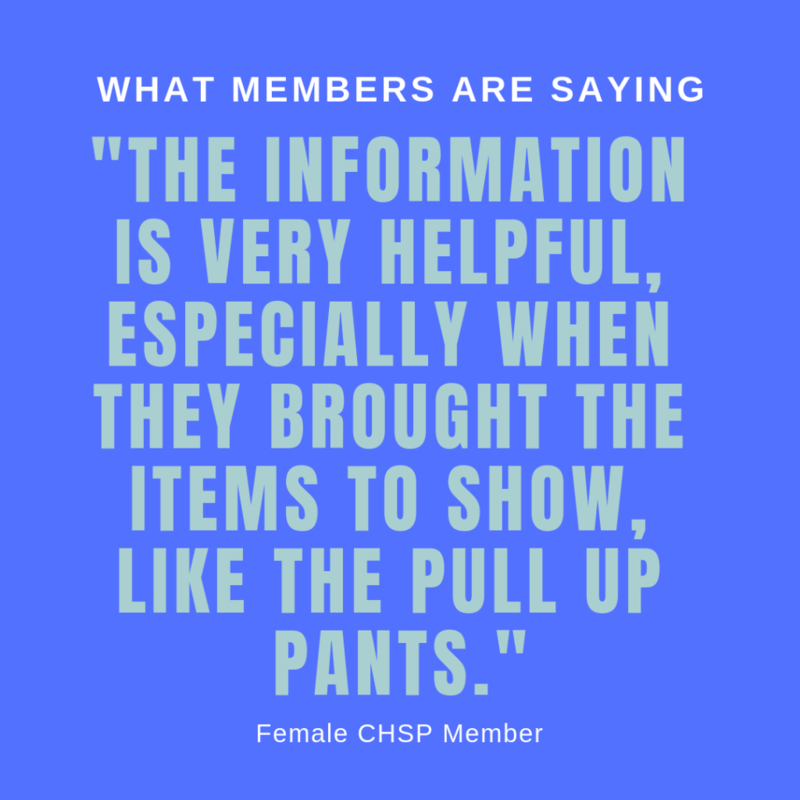 They enjoyed seeing and being able to touch the equipment, which helps with understanding and being able to retain that information. The members feel that this information will be very useful to them in the future. 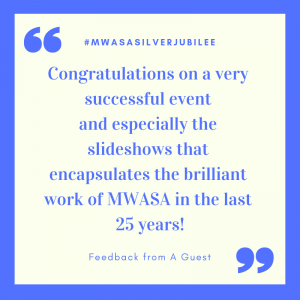 The Muslim Women’s Association of SA (MWASA) Silver Jubilee for Service Providers was celebrated in February, to acknowledge the contribution made by Service Providers towards our success. The event was held in the Bradley Forum Hall at the Hawke Centre. We appreciate the kindness of UniSA in providing us with this beautiful venue. The event was organised by the MWASA Youth group, under the supervision of Project Manager Shaista Kalaniya. The tasks were distributed among the group based on their interest and skills. As always, the Youth Group made us proud by executing another successful event. The program began with Quran recitation by Asyraaf Shahrizan, followed by the translation given by Melissa Ayyildiz. Chairperson Dora Abbas gave an opening speech, welcoming and addressing the guests. 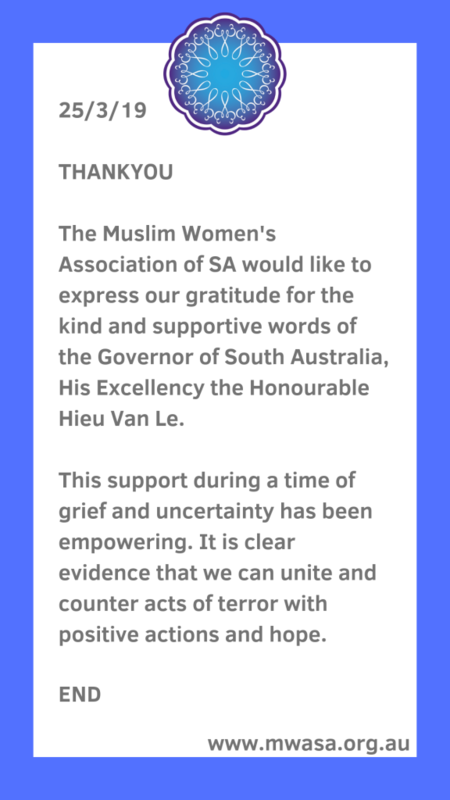 His Excellency the Honourable Hieu Van Le Governor of South Australia and Mrs Lan Le kindly accepted our invitation to be Guests of Honour for the event. His Excellency’s speech was full of encouragement, appreciation and his views on when a refugee feels settled was very thoughtful. 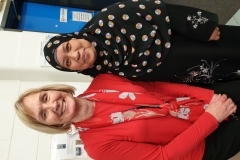 Other guests included representatives from various organisations. A performance was given by Brother Zuhir Naji, a newly arrived refugee from Syria who is a singer and ran a music school in his country before coming to Australia in 2016. He played Oudh (musical Instrument) and sang an Arabic song. His performance was enjoyed by everyone. 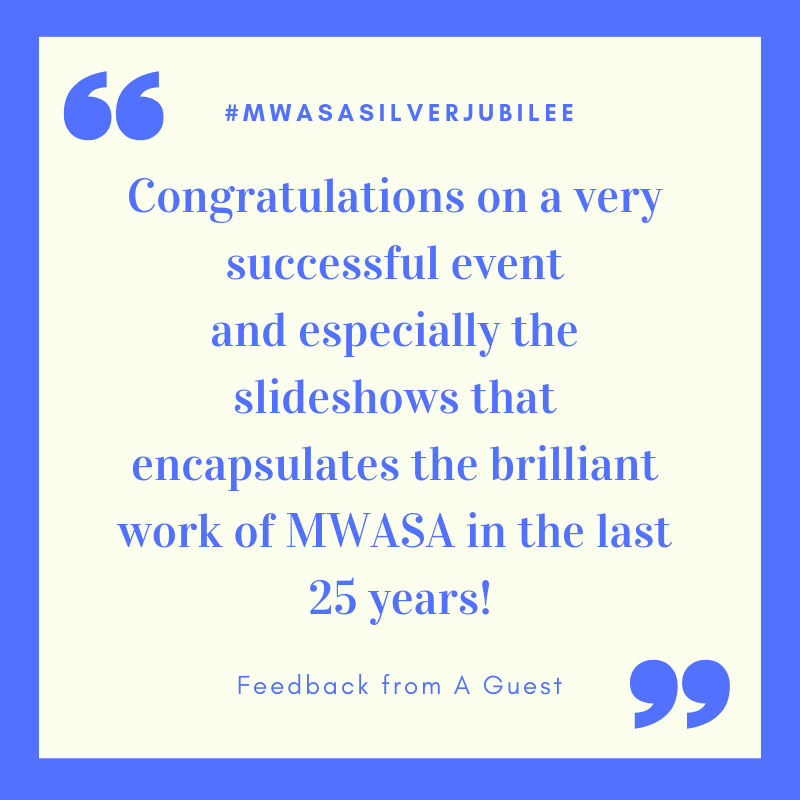 A slideshow was presented on the journey of MWASA, another highlight of the day which received a lot of appreciations from the guests. The credit goes to Zainab Al Hamad and Saad Kalaniya for putting together a memorable presentation. 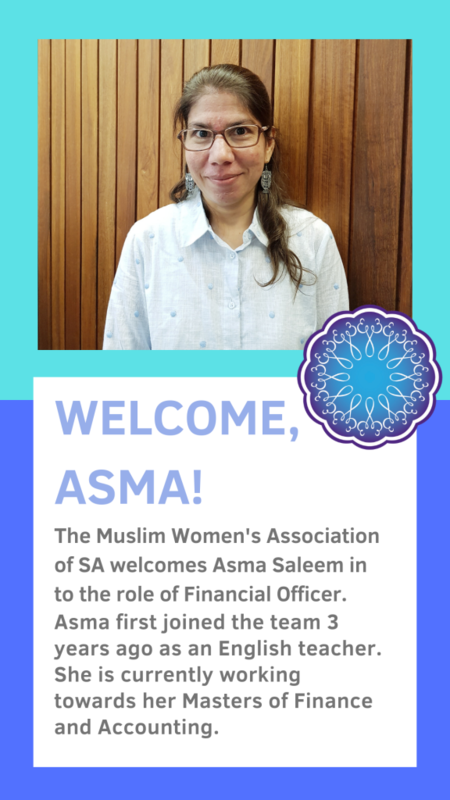 Over the past month, a wide array of members of the Muslim Women’s Association were asked about their thoughts, journey, and experience which they’ve had with the organisation. Their responses were captured and compiled by Melissa and her team. 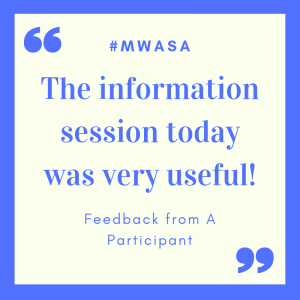 MWASA would like to thank all the volunteers who gave their time and effort in making this event a memorable and successful one. 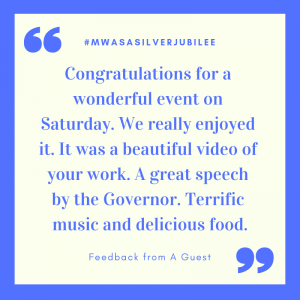 We acknowledge Shamil Jamion who assisted with the videography and producing a video that captured the highlights of the event. We also thank Ramila Chanisheff for being the MC (Mistress of Ceremonies) for the event. 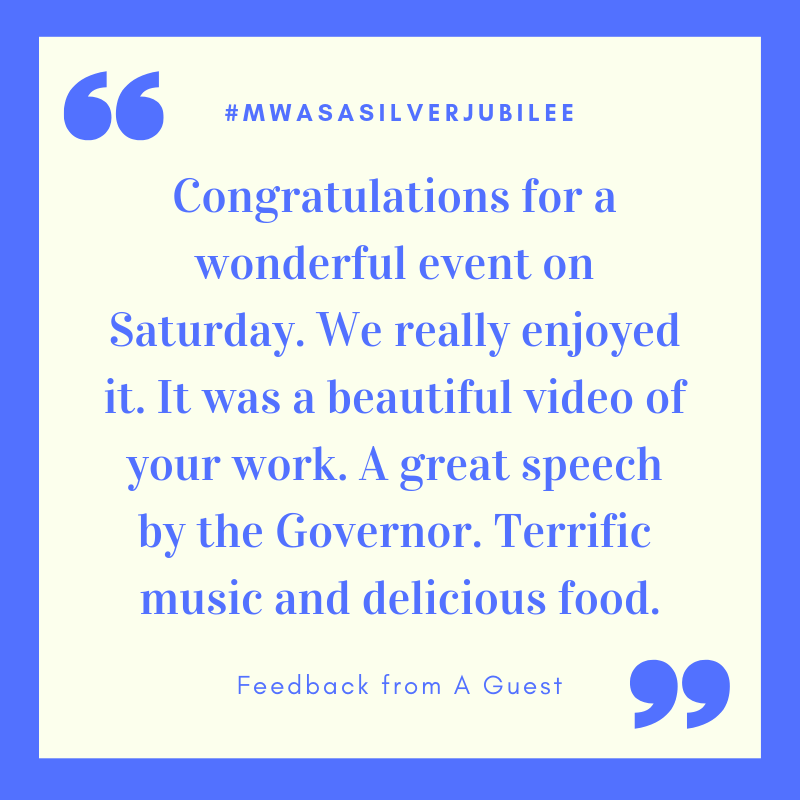 Management would like to congratulate Shaista and the MWASA Youth Group on the successful and memorable Service Providers event. We take this opportunity to acknowledge our sponsors. We thank Nosaiba for all the hard work in getting sponsors. 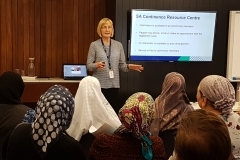 Sonder Employment Solutions is a new program aimed at migrants and refugees living in Adelaide’s northern and western suburbs who receive income support payments and need support with finding employment. 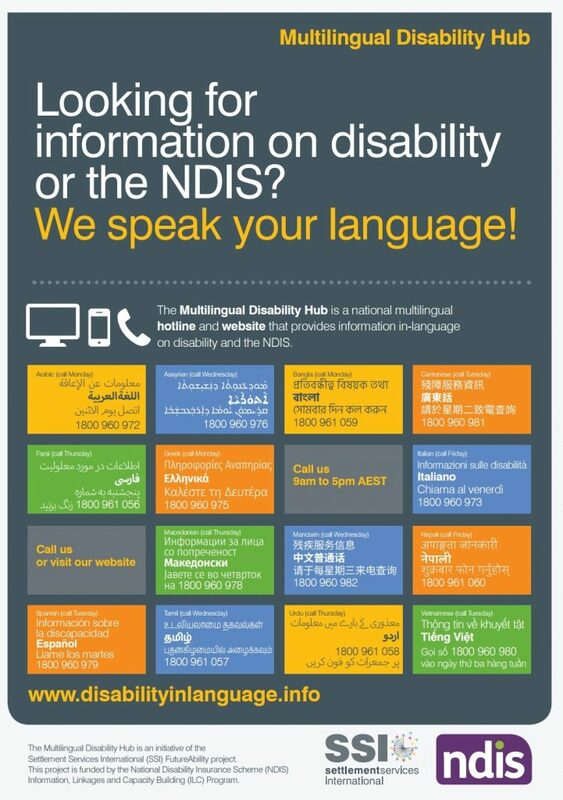 The service is entirely voluntary and is not connected to Centrelink Job Service Providers. 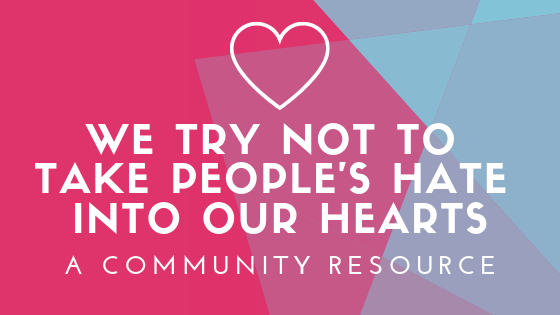 Sonder Employment Solutions is a free program and getting involved is easy. To access the program, complete the online referral form. MWASA Team Takes Out The Trash! 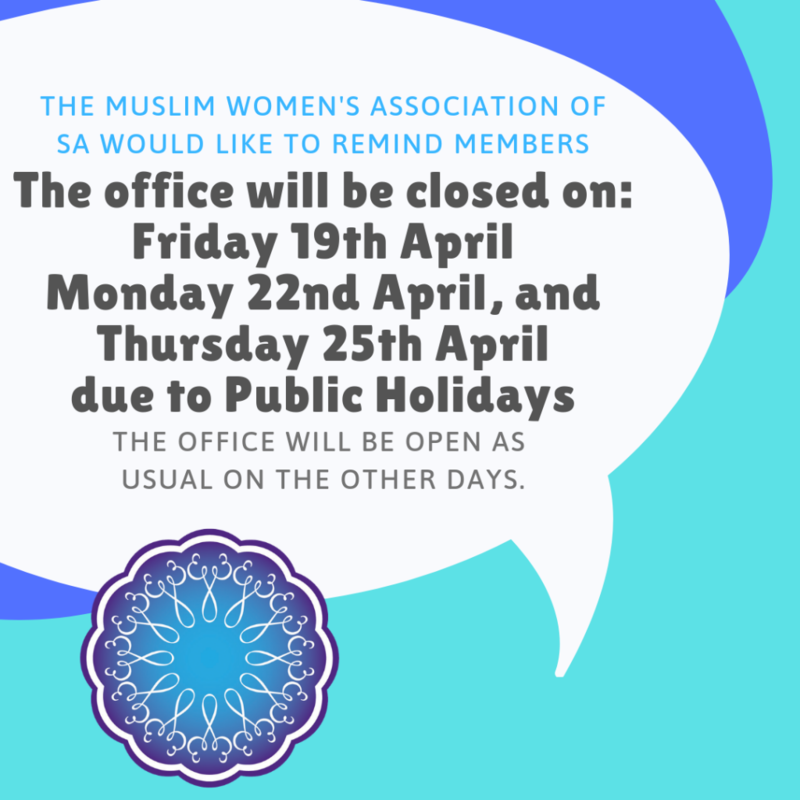 The Muslim Women’s Association of SA (MWASA) put together a team and participated in Clean Up Australia Day last Sunday, 3rd of March. Clean Up Australia Day is Australia’s largest community-based environmental day. It was started in 1989 by ‘average Aussie bloke’, builder and solo yachtsman, Ian Kiernan. His dream of sailing around the world came true in 1987, however his excitement and anticipation turned to anger and disappointment to find the oceans polluted and choked with rubbish. Upon returning home he put together a committee of friends and organised a clean up of his own backyard – Sydney Harbour. Now more than 33 million hours have been contributed by Australians towards the environment through Clean Up Australia Day. We called Adelaide City Council to find out where we could be of service and it was kindly advised that GS Kingston Park/Wirrarninthi (Park 23) could do with some attention. That turned out to be very true, our team with 2 other community groups collected a total of 2,160 litres of rubbish and recycling which was removed from the parklands! 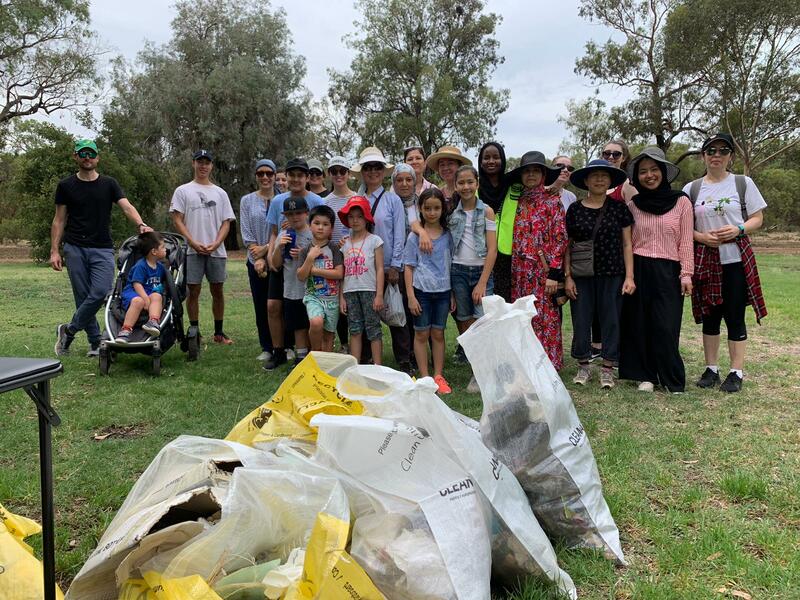 Adelaide City Council collected all the bags of rubbish after the clean up and sorted out the recyclable rubbish and compostable material so that they did not end up in landfill. Our team of almost 30 volunteers were blessed with perfect weather on the day. The whole day was a brilliant success and thanks must go to the volunteers for that, especially Site Supervisor Nosaiba. It’s always a beautiful thing when community members give selflessly from their time for the betterment of the whole. Everyone enjoyed the day and everyone stayed safe, there were no first aid or other incidents. Clean Up Australia Day hasn’t released this year’s statistics yet but it will be interesting reading when they do. 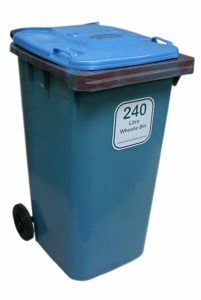 Last year’s statistics showed that more than three times the rubbish was collected in South Australian parks, up from 2017. 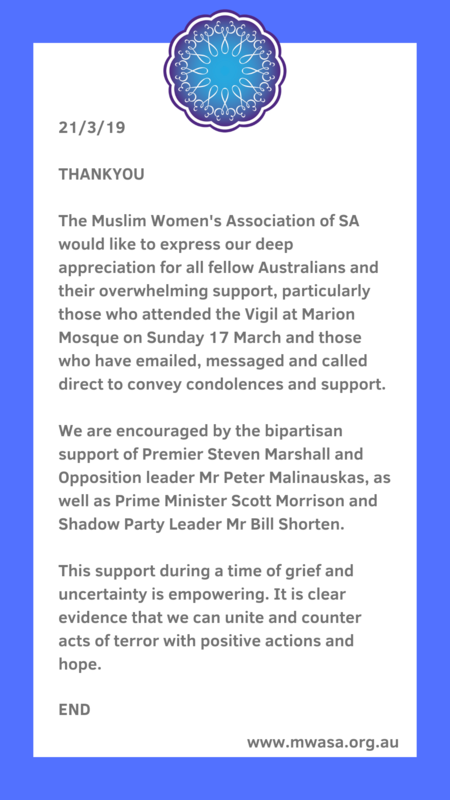 It was encouraging to see that this year the Australian National Council of Imams released a statement encouraging all Muslims to participate. Our team looks forward to next year, we hope you can join us. Until then, there’s so many things we can all be doing in our every day lives to REDUCE, REUSE and RECYCLE. A total of NINE 240 litre bins of rubbish and recycling was removed from the parklands! 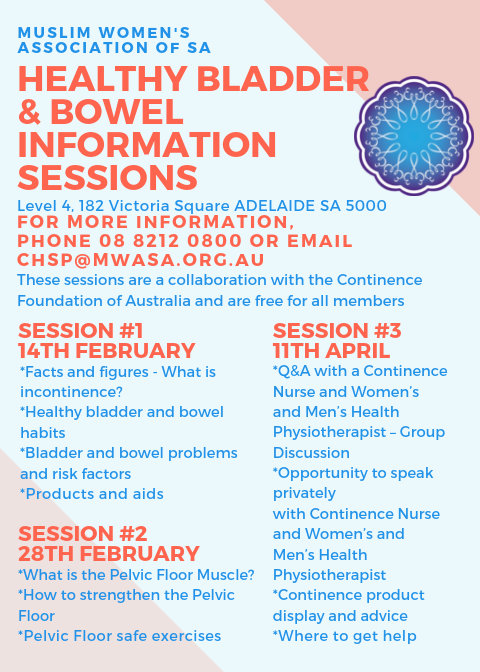 The first of 3 Healthy Bladder and Bowel information sessions took place on Thursday the 14th of February, here at our office. 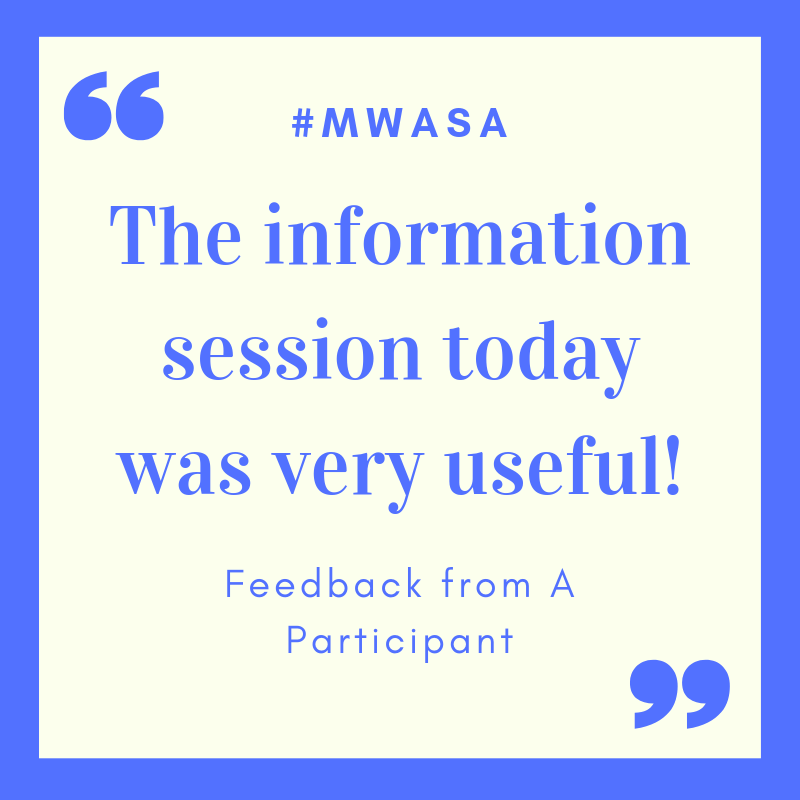 The session was very well attended and the feedback from the members was incredibly positive. 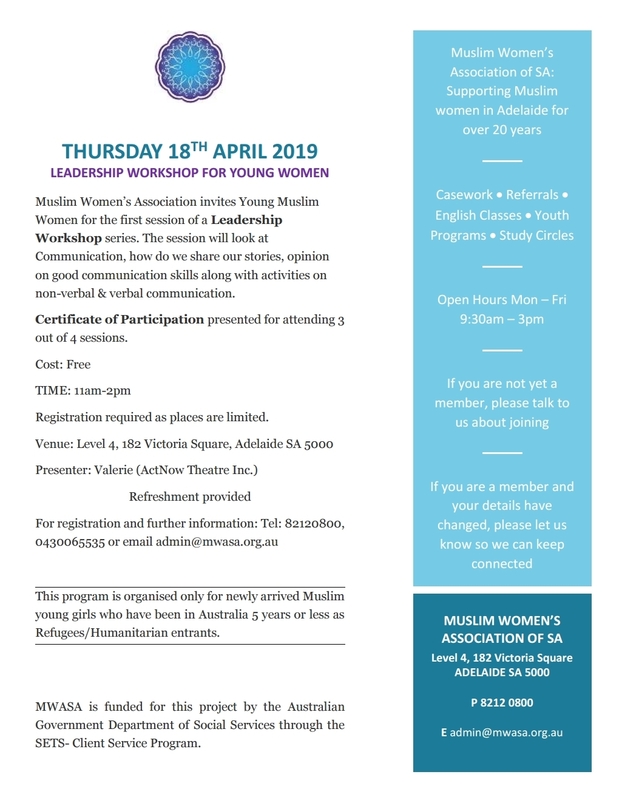 There are still 2 more sessions to go if you are a member and would like to come along. 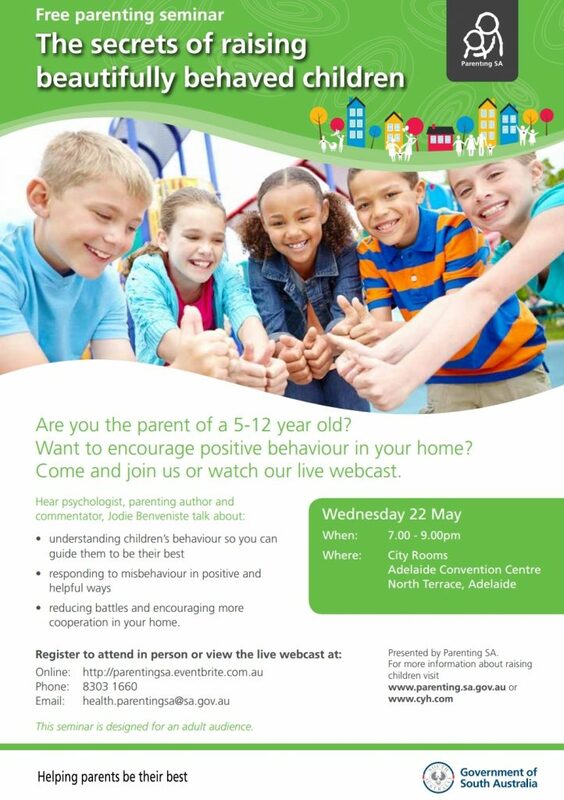 Click here to see the event flyer. 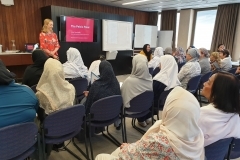 A group of young Muslim women living in Adelaide came together on this project to discuss different ways not to take people’s hate into their hearts, a very useful community resource at a time when Muslim women are regularly experiencing things like being stared at or yelled at in public. Please visit the project page to view the full video and transcript. All sessions will be held between 11am and 1pm.